Robbie Jones is an artist from North Cornwall, UK. 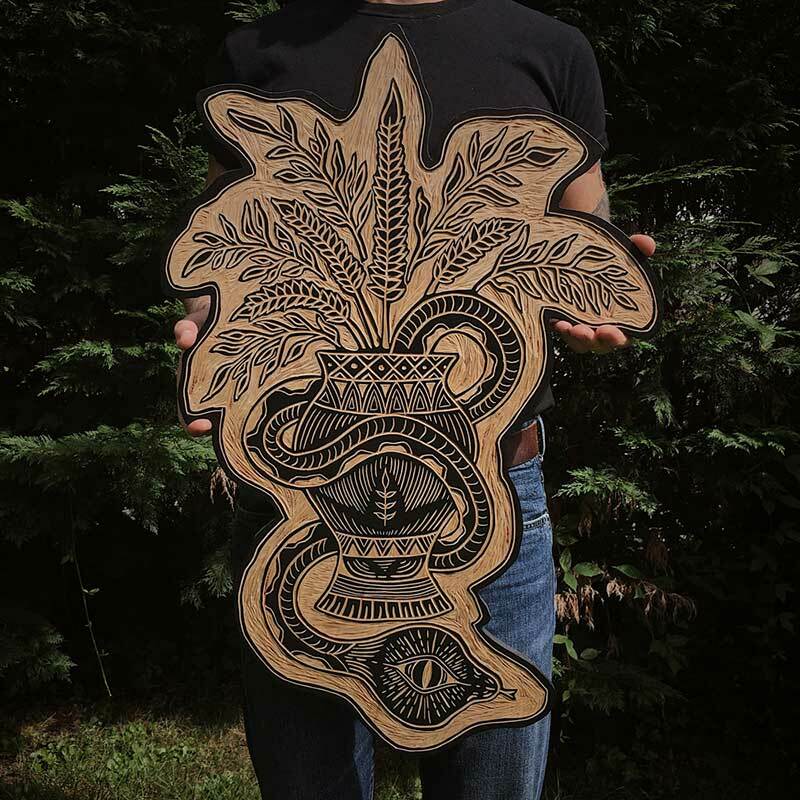 He’s known for his unique hand carved woodcuts, which are inspired by traditional tattoos and nature. “Vase” design available here & “Cat” design available here. – Can you take us through the steps of creating a piece? I always start with a rough sketch in my notebook, then I’ll play around with the idea a bit and start working on a more final design which I can make a basic stencil of. Which will then be applied to the wood and cut out using a jigsaw. Then a coat of black paint and once that’s all dry I’ll add back on the stencil and trace it onto the wood and start carving out with some palm tools. I try to keep the stencil as minimal as possible, so I have room to freehand line work, I like to try and stay loose with all the mark making. After It’s all carved out I’ll apply a layer of stain, just to protect the wood. The whole process is quite lengthy but it’s always satisfying seeing the end result and looking back to how it started. – Why don’t you ever print with your blocks? Are you not tempted? 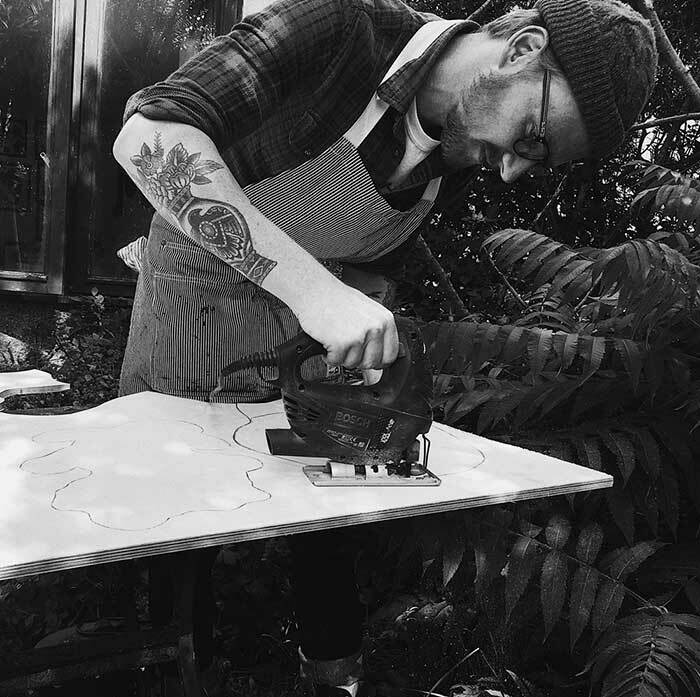 Printmaking was what started me off working with wood. I tried a few very rough prints in the beginning but in the end I always ended up liking the original block more. For me I honestly really love the appeal of the woodblock itself, making an original piece that’s full of different knots, colour tones and grains is just something that works for me personally. – What are the benefits of traditional techniques? & are there any other traditional techniques you’d like to try? I find that you just can’t beat making something with your own hands. It’s all these little imperfections and rough edges that give the final piece more character and personality. I’d love to work on some much larger pieces maybe doing some traditional sign painting style pieces would be a lot of fun. – Have you ever had any strange commission requests? Nothing I can really think of that strikes me as strange. I get a lot of movie related commissions like the Death star from Star Wars has been a recent one that’s been popular lately. Also pet portraits have been pretty popular lately, so I get a lot of funny photos of cats and dogs sent to me which is pretty great. – For everyone that’s not familiar with Wadebridge (Cornwall, UK), what keeps you there? There’s some sort of wildness to North Cornwall, being so close to the sea, woods and moorlands all at the same time, it’s hard not to get outside and let it inspire you. That and a good creative scene is what I think is keeping me here for the time being. – Where does your inspiration come from? 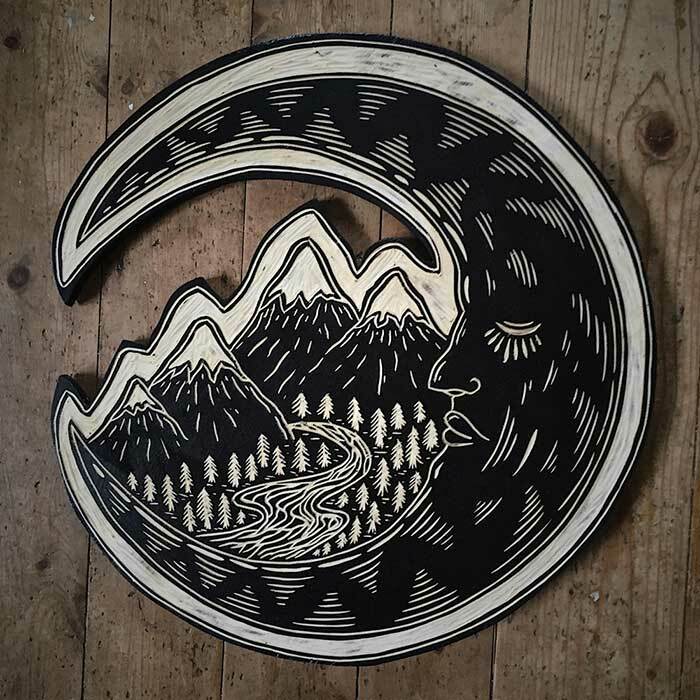 My main inspiration comes from traditional tattooing, the super bold imagery is so eye catching and it’s something I try to recreate when designing and making a woodcut. Nature is another one of my favourite themes. David Attenborough has always been a bit of a hero of mine and growing up watching his documentaries has always given me an appreciation for nature and wildlife. 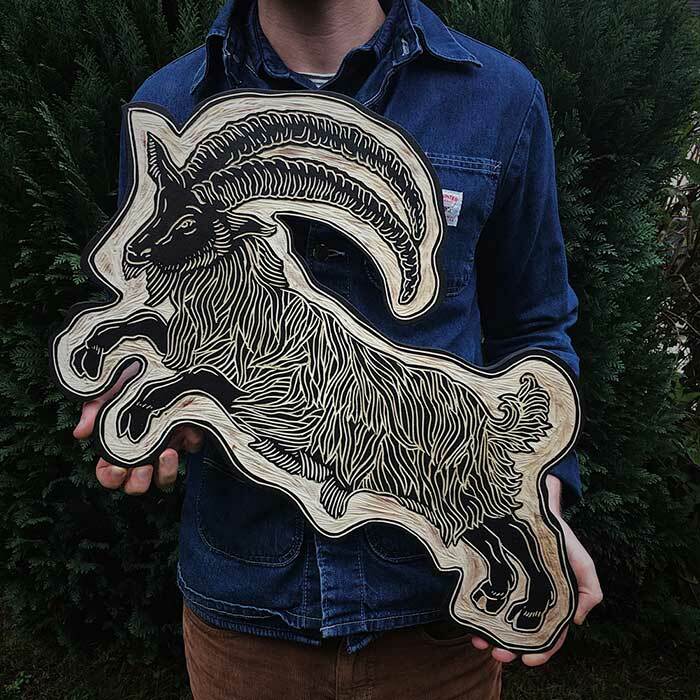 So making big mountain scenes and animal woodcuts always seems to come naturally. – I’ve found that if you sell your own art, customers want to buy into you as a person. I feel like you’re quite secretive, how have you managed to build your following without customers knowing too much about you? Yeah it’s defiantly something I’ve been trying to work on with the current difficulties of being a small business on instagram. 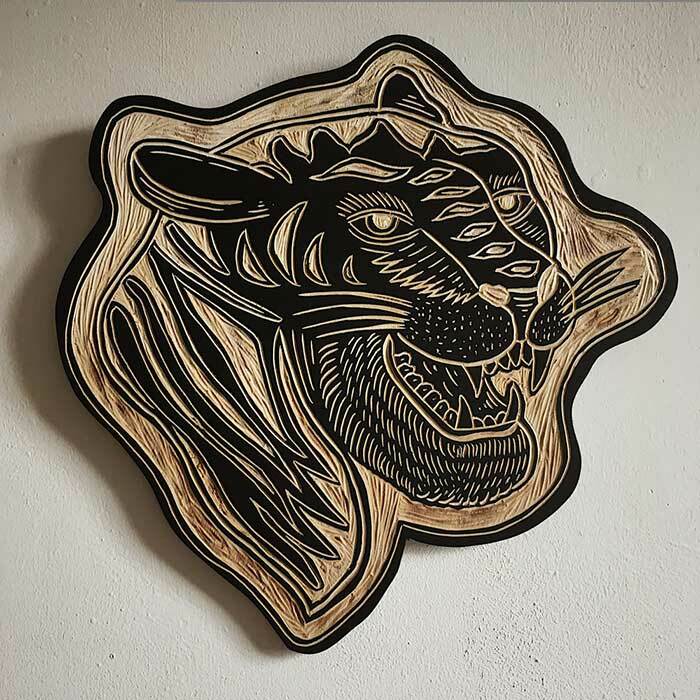 Personally I’m a pretty shy and quiet guy, I’ve been making woodcuts for roughly 5 years now and just like sharing what I make rather than focusing on my personal life. I’ve been really lucky having the support of so many talented makers and illustrators helping get my work out there. So I’m forever thankful to those who have supported what I make.